iSkysoft’s PDF Editor pro is a simple multi-functional application in editing PDF documents on Windows and Mac. It provides a wide range of features to customize PDF documents like converting, editing and merging of documents. Its features are streamlined for both Mac and Windows users and are fully compatible with Adobe Acrobat PDF files. 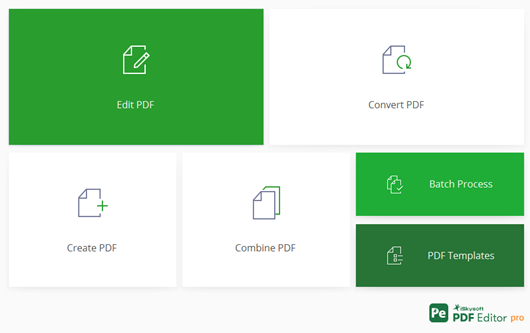 On a glance, a quick access to major features is provided for editing, converting, creating and merging PDF, access to ready-to-use PDF templates and Batch Process execution to convert many files at a time. 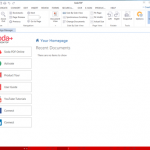 The Home page contains dedicated options like “From file” where you can create a PDF file from any type of input file format, “From Scanner” option where a PDF file can be created directly from scanner,” To Word” where a PDF file can be converted into Word file format and “To others” option, where the PDF files can be converted into other file formats like Image, HTML, PowerPoint, Excel, etc. There are also options for different page views. 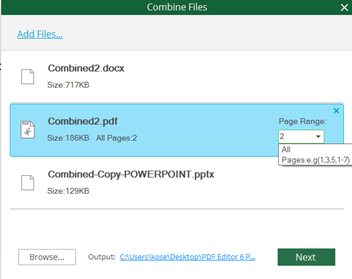 In the “Combine PDF” option, different file formats can be merged into a single PDF file where you can add files to merge or drag-and-drop the files. It also provides an option to selectively merge a single page or a page range only for the PDF files that are to be merged into a single PDF file. The merged data is accurate apart from the fact that the page numbers of the previous files remain the same irrespective of the order they are merged. If this specific feature is also embedded into the software that corrects the page numbers per the order of merging, it would keep this product in the top ratings. Nevertheless, the speed of execution is quick for file conversions or merging. PDF Editor pro supports most input file format types to convert into PDF files like txt / png / jpg / jpeg/ bmp / gif/ rtf / pdf / doc / docx / xls / xlsx / html / webarchive. The Page view mode is to view the PFD file pages fit to actual page size, window width, window height and full window. You can also view one page at a time, pages continuously with scrolling enabled, pages side by side with continuously scrolling enabled and two-page side by side. You can zoom in/out and at the same time view multi-tabs. PDF Editor pro works just like Word document to edit PDF files. Features like font attributes (size, style, alignment), page numbering, header & footer, hyperlink insertion and deletion, cut, copy, paste, edit, delete make you feel like you are using Microsoft Office Word. In addition to the above, you can add, edit and create your own digital signature on the PDF. OCR (Optical Character Recognition) technology helps to convert scanned PDF into editable and searchable document. 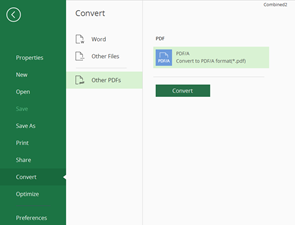 With this feature, you can export data from scanned PDFs too. Up to 23 languages can be recognized by this software. PDF Editor pro software version supports output formats options like Word, Excel, PowerPoint, Image, Text along with formats like EPUB, HTML, RTF, HWP and HWPX. An ISO standard output format PDF/A for long-term archiving feature is also supported in this software where normal PDF files can be converted into standard PDF files. 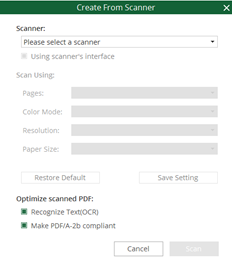 The Scan & Convert options allow you to directly convert into PDF from the scanner. Dedicated options are provided to convert a PDF file into Word format and to convert into other formats like Text, EPUB, HTML, image etc. maintaining the original layouts. Sensitive data can be searched and redacted and they can also be marked for redaction by using dedicated options like “Mark for Redaction” and “Search & Redact”. Unauthorized users PDF document access can be restricted by using password protection services. Permissions can be restricted to filling form fields and signing, commenting, inserting, rotating, deleting and extracting pages along with printing. 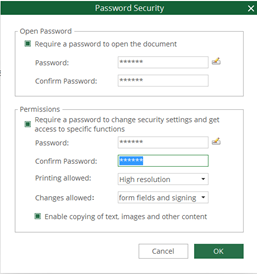 The PDF file with permissions set is fully compatible with Adobe Acrobat PDF file and you are required to present with the password for file accessing. Digitally sign, place and validate signatures feature is also present where each page can be custom watermarked for authenticity. 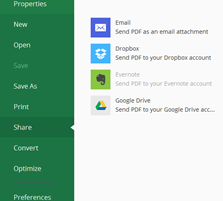 The PDF file which is edited/converted can be saved to cloud storage devices such as Google Drive and Dropbox, can be sent as an email attachment or it can be directly be emailed/printed. A single license is priced at $99.95 and depending on the requirement of multiple licenses between 2-20 PCs, savings apply accordingly. A quote can be requested for more than 20+ licenses offering many other discounts. Including PayPal, all major credit cards are accepted. A free trial is version is allowed where there is a functional limitation. A 30-day 100% money back guarantee is provided if you are not satisfied with the software product performance. A one time payment includes free annual updates. There are some dedicated options like Online Help, Community and YouTube resources on the Help Tab. Live chat facility is not available but they provide technical support by email where they give responses within 24 hours. The “Online Help” option routes you to a support page where you get a list of troubleshooting answers, but when you try to check the online tutorials, a page with how to use the software is opened with screenshots of older format of the software but not exactly the tutorials needed. The “community” option also routes you to the support page where you find no communities. Not sure why this option is given in the first place. When the “YouTube” option is clicked, you are routed to their general YouTube page of the iSkysoft’s but not specific to the software that we are using. The Software needs to be restructured in this “Help” tab completely giving the proper links and improving the ease of finding the perfect solutions that really help to understand to proceed further. PDF Editor pro software runs on the operating systems like Mac and Windows. Windows users can run it on Windows XP/7/8/10 versions and MAC users can run it on Mac OS 10.12/10.11/10.10 versions. After conversion from Word to PDF, hyperlinks are not preserved.